Amid signs of mass defections as the international community began putting pressure on North Korea in the wake of its latest nuclear test, the regime in early May gave orders that no resident was to be allowed to flee the country, followed by a massive crackdown. The National Defense Commission gave village-to-village indoctrination lectures on a massive scale, apparently prompted by fears that the times when the order alone was enough were gone. Anybody who crossed the Apnok (Yalu) or the Duman (Tumen) River without permission would be considered a traitor, villagers were told. The Chongori reeducation center in North Hamgyong Province that went through the greatest change. The center has been reorganized as a concentration camp exclusively for arrested defectors. It has reportedly turned into a living hell, where labor is much heavier than at ordinary reeducation centers and where torture and beatings are routine. Until 2007, North Korea had categorized defectors three groups. The first consisted of those who had gone into foreign embassies to get to South Korea or had taken similar action, or converted to evangelical Christianity. 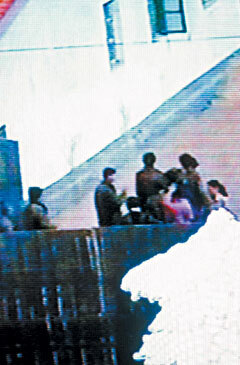 If arrested, they had been detained at Yoduk political prison camp. Most Yoduk inmates had been sentenced to between 10 years and life in prison and were considered traitors. The second group were those who had spent an extended period in China without intention to go back to North Korea, although they had neither attempted to flee to South Korea nor converted to Christianity. The third group were categorized as "simple defectors" who had fled the North due to lack of food. Those in the second and third groups were sentenced to between six month and two years of hard labor. But now, anybody who has crossed the border has unconditionally been sentenced to up to three years of forced labor at Chongori, under instructions that they are to be punished as traitors. Even those who have been caught while approaching the Apnok or Duman Rivers without good reason, though they have not actually crossed the rivers have been branded with attempted defection and put into the reeducation center. As a result, it is hard to see anyone except border guards along the shores on the North Korean side of the border with China. Those who carry Chinese mobile phones and try to connect to the outside are also subject to the level of punishment reserved for defectors and taken to Chongori. In the past, such people had been sentenced to three months' labor as a part of the prison discipline in addition to a fine of 500,000 North Korean won. The average monthly pay for an ordinary North Korean worker was 3,000 North Korean won at the time. Since 2003, when mobile telephone traffic increased in the areas near the North Korea-China border, China has built many signal towers there. As a result, communications, which had been possible only in some mountains near the border, is now possible in nearly all urban areas in North Korea including Sinuiju close to the border. But North Korea is cracking down on Chinese mobile phone carriers because they could help smuggle out information and encourage defection. It has reportedly recently launched an around-the-clock watch, providing all security guards in the border areas with portable radars. Any mobile phone carrier would see a security guard vehicle arrive immediately if they engaged in a phone conversation for more than five minutes, so they are safe to use phones if they do so in the mountains, where they do not need to worry about being caught by security guards. One defector who had a hair's breadth escape from Chongori, has said, "Chongori is a living hell. Yoduk (the notorious prison camp) is a much better place." At Chongori, inmates are doomed to die of malnutrition. Forced to work for 14 hours a day, they are given only two whole potatoes and a handful of cornmeal a day. Few inmates stick it out for more than three months, no matter how healthy they are, because beatings are a daily routine there, he said.